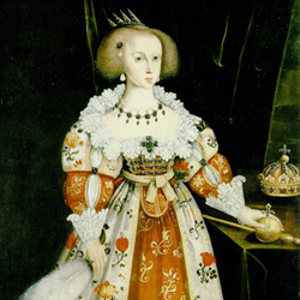 Queen Cristina is one of the most interesting personages of the seventeenth century. The daughter of Gustavus Adolphus, she became queen of Sweden at the young age of six upon her father’s death in Thirty Years War. She was very interested all of the arts and especially in music. In 1654 she abdicated her throne, converted to the Catholic faith, and moved to Italy where she became one of the prime patrons of the arts, supporting composers such as Carissimi, Corelli, Marazzoli, and Alessandro Scarlatti. This concert by Armonia Celeste is programmed to reflect two aspects of her life: the court and the chapel. Roman cantatas make up half of the program while music for the church and private devotions will appear on the second half. Music that survives in the manuscripts associated with Sweden is blended with music composed and performed in Rome during her residence there, all in homage to one of the most interesting figures in history.